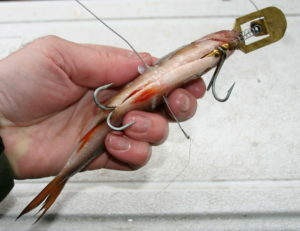 Lucy Lures dead bait trolling rig is a two part rig designed to ‘fly’ a bait down the water column in search of predatory fish. 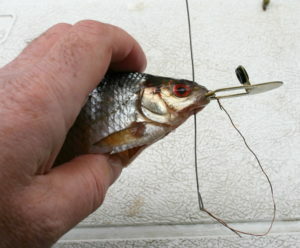 The rig is designed to readily transfer the hooks from the bait to the striking fish. The rig is an instant strike rig, designed to be fished as a lure rather than as a bait. I recommend you keep the hook points sharp. Please note, that the diving vane should be kept relatively flat. 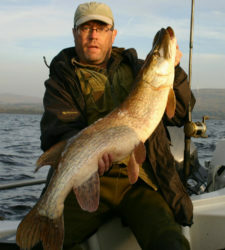 It is designed to produce down force rather than to impart a wobble to the bait. 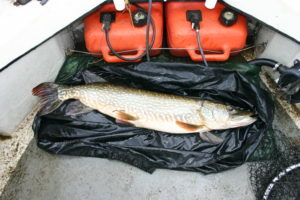 When trolled between one and three miles per hour, the bait will ‘swim’ upright all on its own and depending on the distance the bait is trolled behind the boat, small baits (5” to 6”) will swim down several feet without any lead. 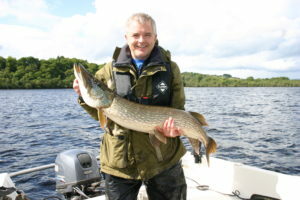 Fine Ferox caught by the guys at Fish Loch Ness. 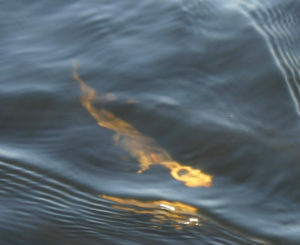 Gut your dead bait, cutting the bait’s belly as far forward as possible while maintaining its form. With the copper wire hanging freely below the diving vane, insert the diving vane into the mouth of your gutted bait, making sure the flat section of the vane fits snugly inside the bait’s mouth. Pass the free end of the copper wire with a baiting needle up through the lower jaw of the bait, through the hole in the vane and out through a nostril, pull the wire up snug and wrap it firmly around the snout of the bait as many times as required. 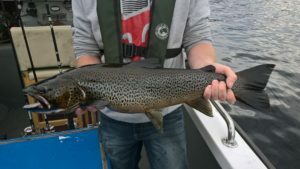 You should find that will be sufficient to hold everything in place and keep the mouth of the bait shut and prevent the diving vane moving in relation to the bait. Pass the loop in the free end of the hook set through the grommet in the diving vane from behind/below and pull the titanium wire trace through until the spring and hooks come up snug with the diving vane and bait. Push the rear hook and brass spacer into the body cavity of the bait and using a baiting needle and fine copper wire, close up the bait’s body cavity with a single stitch of fine copper wire. Attach the loop in the free end of the titanium wire trace to a conventional snap swivel and you are ready to start trolling.